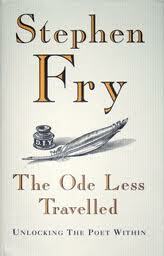 This book is delightfully informative – it is impossible to be unaffected by Fry’s passion for poetry and gentle, self-deprecating humour. Because I procrastinated on many of the 20 challenging poetry exercises Fry poses in this book, it took me about half a year to complete. As a result of this, I am still basking in the self-satisfaction of successful completion. NB: There are several rude/adult innuendos in the book, so I wouldn’t recommend it for young people in its entirety.